In 2008, Trish and I wrote a script called Bodhisattva which spanned a life of a business tycoon from age 7 to 70 and depicted his rise and fall through India, USA and Brasil. But that would be a period piece and a budget to think of. So instead of trying to raise funds and realizing it would take time, we decided to embark upon the last part of his life to start with. We named the script Bodhisattva. We wrote it as a separate script, a thriller, that could be made independently and would have nothing to do with the original Bodhisattva. It could also be shot entirely in one of the most cinematic cities to film in - Calcutta. 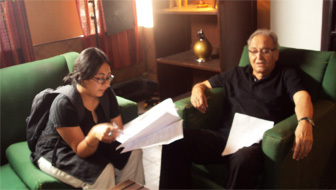 We wrote the script in October and approached our favorite actor Mr. Soumitra Chatterjee (Apu of Academy Award winner Satyajit Ray's The World of Apu) and narrated the story to him to see if it was even worth it to try. And he inspired us with his excitement and told us to move forward. We were then faced with the challenge of time to complete the entire film in a month. That meant shooting, capturing, editing, dubbing, foleying everything in a month. But thanks to our guerilla background, and small but extremely hardworking crew, we pulled through the film within the time frame. Thanks to the city of Calcutta for its extraordinary passion for art and culture, we got the film done without any hassle and on schedule. I was very excited that this will be a film without any music. Except for one scene where I wanted to use a song - a song that has to be so perfect that it will elevate that moment captured. And there was only one singer that kept coming back to my mind - Welsh opera singer Paul Carey Jones. I contacted him through email and he was excited to be a part of this film as he already knew the works of Soumitra Chatterjee from several of Satyajit Ray films. An Italian opera performance of a Welsh musician in a Bengali language movie shot in Calcutta - truly the language of cinema is Universal. And we sailed through three months from the time of our first script draft in making our first foreign film Bodhisattva. We hope you enjoy watching the film.